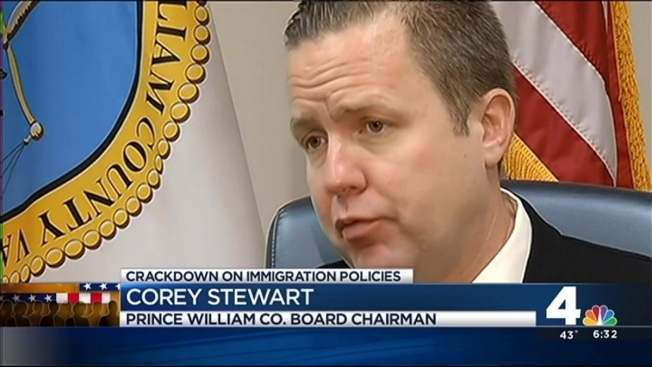 Prince William County's top elected leader is threatening to fire anyone who may have tried to undermine the jurisdiction's tough immigration policy. The harsh statement comes after the county board chairman discovered the police department failed to report encounters with some illegal immigrants to U.S Immigration and Customs Enforcement, or ICE. Prince William County made national headlines in 2007 when it enacted one of the toughest policies aimed at undocumented immigrants who commit crimes. The policies require that the immigration status of every individual arrested be checked and that those who are undocumented be reported to ICE. They also require that if a suspect is detained and a query to the National Crime Information Center system shows he or she has an outstanding criminal or civil ICE warrant, ICE must be notified. But Stewart just learned through a media report that the police department may not be notifying ICE when officers get a hit on someone who has a civil warrant -- for example, someone who failed to show up for a deportation hearing. "I'm very, very, very concerned about that," Prince William County Board Chairman Corey Stewart said. "If we find out that someone has deliberately undermined the policy of the board, I would consider that insubordination and an offense that could result in termination of employment." In a special closed meeting last weekend, Stewart shared his findings with the Board of Supervisors. Members voted unanimously to immediately launch an inquiry using a outside audit agency. "In addition to the audit, we directed the police chief to immediately begin informing ICE of all hits on ICE warrants, whether criminal or civil," Stewart said. Prince William County Police Chief Stephan Hudson also has launched his own internal investigation. He says he's equally concerned to learn about the possible breakdown in sharing information with ICE. 'If we are not performing that kind of notification to ICE and have not been doing it for a couple of years, that is concerning to me," Hudson said. "I have yet to understand the depth of the frequency of this type of encounter, which is partly what I'm diving into now." The police chief said a preliminary look indicated officers do seem to be reporting all ICE hits they get in the field. They often notify what's known as the Criminal Alien Unit, which in turn informs ICE. The chief said that may be where the communication breakdown has occurred. Part of the problem might also be that in 2012 the federal government ended a program, known as 287(g), that facilitated information sharing between local law enforcement and ICE. The termination of that program may have led to confusion and a lack of communication, Hudson said. The police chief said he expects to have more answers later this week. Stewart expects to have results from the audit by early December.